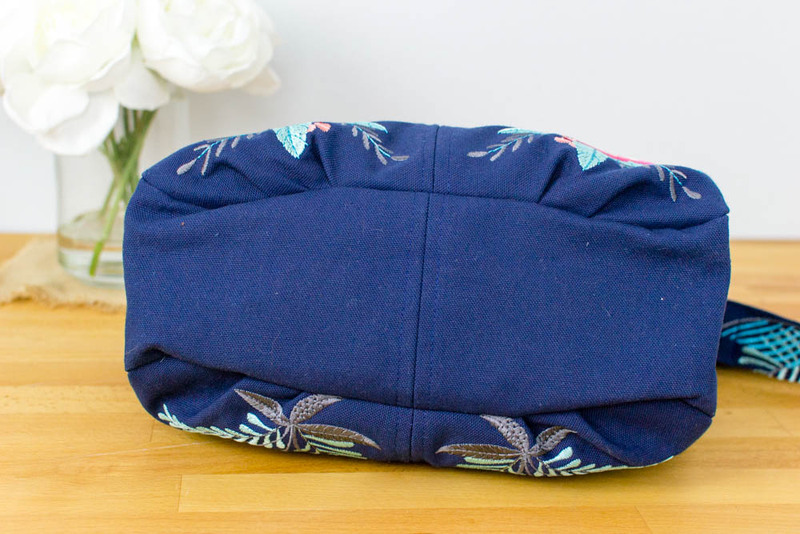 The Happy Hobo Bag - free sewing pattern & tutorial! Sew up a beautiful hobo bag - it’s easier than you think! As I designed the pattern for this bag, I wanted to keep it simple enough that it wouldn’t take more than a day to sew, and yet still have all the features that I want in an every day purse. This bag is approximately 8’’ tall, 12’’ wide, and 4 1/2’’ deep (not including the strap). And pleats at the bottom to help give it that relaxed slouchy shape. Don’t be alarmed that the pleats are not repeated on the interior lining pieces. This bag is still super roomy! This is a feature that I learned from de-contructing designer bags that I found at the thrift store. You often don’t need the pleats on the inside, they are for looks only. Optional features include side pockets (that can hold a normal sized cell phone - this is the iPhone X), an interior welt zipper pocket, and an interior key clip. Feel free to add these features - or not - depending on your needs and available time. My strap is fixed, but you could use a slider to make the strap adjustable. 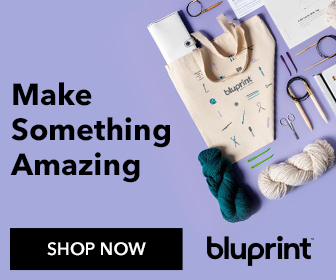 I recommend using home decor weight fabric such as canvas, sateen, or twill for the exterior of this bag, in addition to medium weight fusible interfacing. I had a floral bag in mind, and I didn’t have any home decor weight floral fabric in my stash - so I embroidered my own! This is navy canvas duck - I love canvas because it’s inexpensive, durable, and easy to sew with. If you want a floral canvas (and you don’t want to embroider your own), I found lots of beautiful ones here and here. Download the Happy Hobo Bag pattern templates here, and let’s get sewing! Fuse the pieces cut from fusible interfacing to the wrong sides of the bag exterior side pieces and exterior gusset pieces. 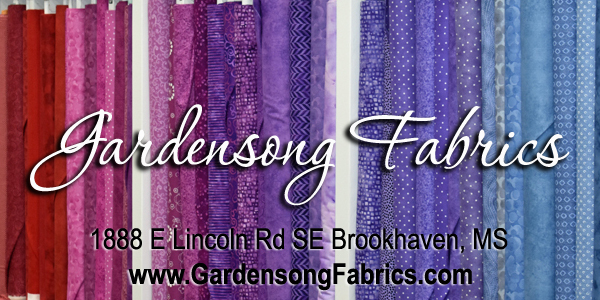 Use a 3/8’’ seam allowance, except where noted. 1. Mark the small pleats on the bag exterior pieces. Fold each pleat so the outer line meets the line next to it and then fold the pleat under and toward the bag center. Pin. 2. 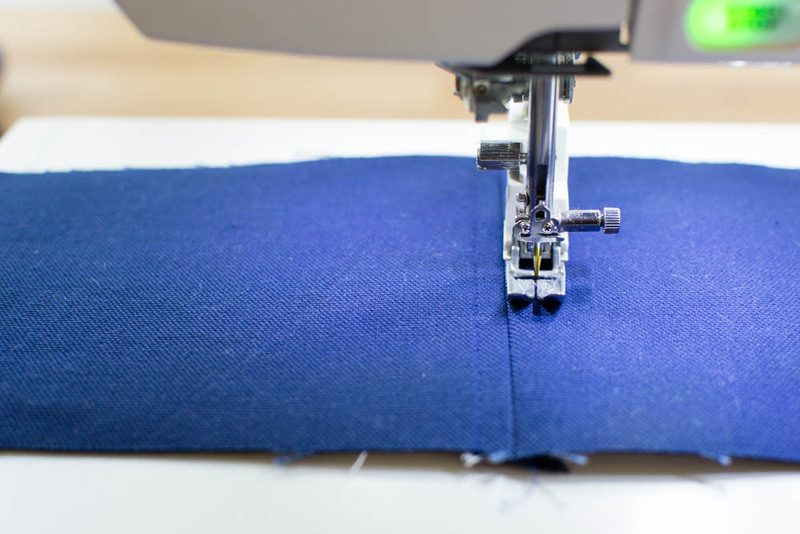 Stitch along the bottom of the bag to secure the pleats, sewing with a 1/4’’ seam allowance. Repeat for all 4 bag exterior pieces. 3. Place 2 bag exterior pieces right sides together and sew along the center seam (3/8’’ seam allowance). Press the seam open. 4. Topstitch along both sides of the seam, 1/4’’ away from the seam. Repeat for the other 2 bag side pieces. 5. Place 2 exterior gusset pieces right sides together and sew along the center seam (3/8’’ seam allowance). Press the seam open. Topstitch along both sides of the seam, 1/4’’ away from the seam. 1. Place a pocket and pocket lining piece right sides together. Sew along the top (narrower) edge. Press the seam open, and then fold the pocket pieces back, wrong sides together. 2. Topstitch along the top of the pocket, 1/4’’ away from the edge. 3. Use the fabric marker or chalk to draw a line across the gusset, 7’’ away from one of the ends. 4. Place the lower (wide) end of the pocket against the line with the top edge near the center seam (right sides together). Pin in place. Sew across the pocket, 3/8’’ from the raw edges. 5. Trim the seam allowances 1/8’’ away from the seam. Fold the pocket up so that the pocket lining is against the gusset. Pin the pocket to the gusset. Topstitch along the bottom of the pocket 1/4’’ away from the seam. 6. Baste the side edges of the pocket to the gusset with a 1/4’’ seam allowance. Repeat steps 1-6 above to sew a pocket to the other side of the gusset. 1. Pin or clip the gusset all the way around one of the bag sides, right sides together. Match the center seams. Make 1/4’’ clips in the gusset to help ease it around the curved corners of the bag sides. Tip: I like to use wonderclips to attach curved edges to straight edges. If you push the clip in by the same amount as the seam allowance (3/8’’) it will help you fit the gusset to the bag side. 2. Sew the gusset to the bag side, with the gusset on top. Sew slowly to ease the two pieces together. Press the seam open as best as you can. Repeat steps 1-2 above to sew the other side of the bag to the gusset. 3. Mark the center of the zipper, top and bottom, both sides. 4. Clip or pin the zipper to one curved top edge of the bag with the right side of the zipper against the right side of the bag. Match the center of the zipper with the center seam on the bag. 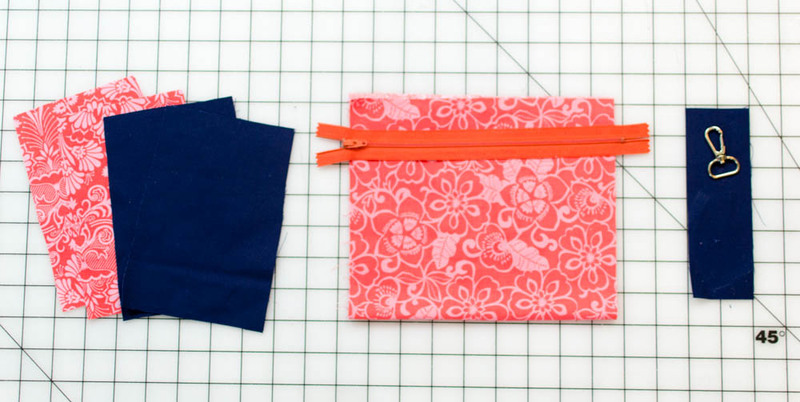 Sew the zipper to the side of the bag with a 1/4’’ seam allowance. 5. 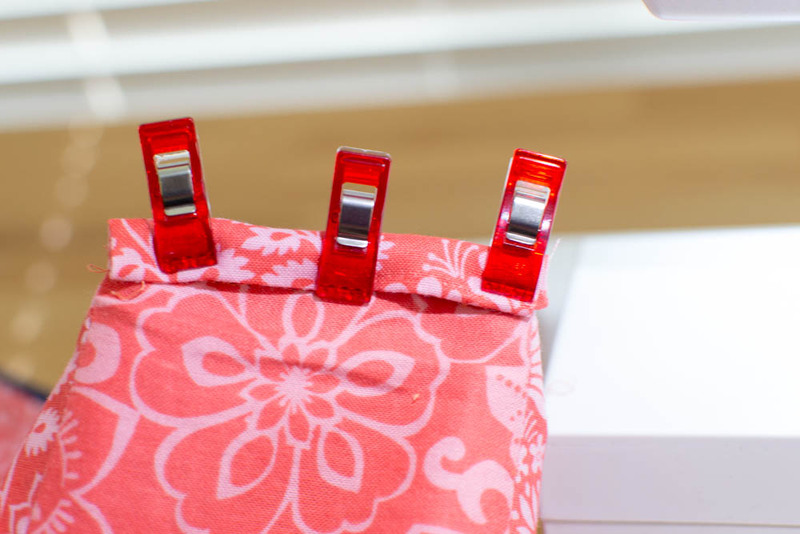 Clip (or pin) and sew the other zipper tape to the other side of the bag in the same way. 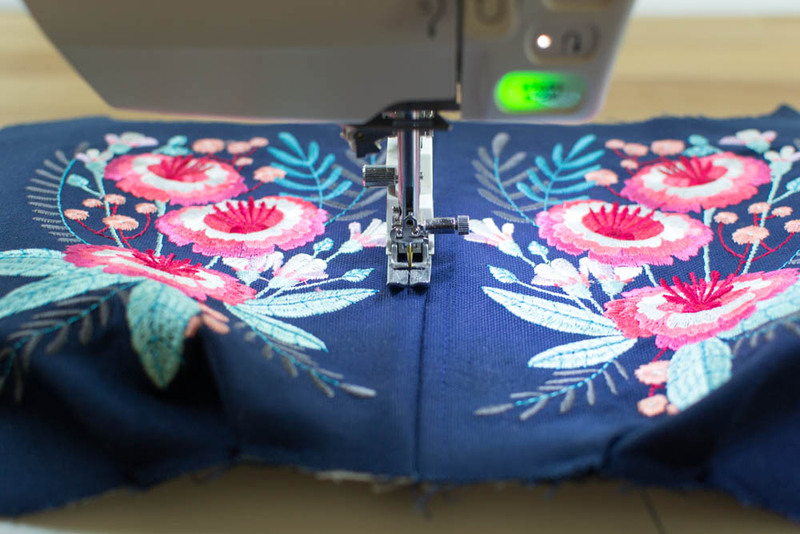 Tip: test to make sure your zipper will be sewn correctly by gently starting to zip it up while it is clipped, before you sew. Note that the ends of the bag (including the gusset) are not sewn at this time. 1. If you would like to add the optional interior zippered pocket, mark and sew the pocket piece centered and 1/2’’ below the top edge of one lining piece using my Welt Zipper Pocket instructions. 2. Sew the gusset lining to the side lining pieces, just like you did with the bag exterior. 3. With the bag exterior right side out, place the lining over the bag, right sides together. Pin or clip the curved side edges of the lining over the top curved edges of the exterior - with the zipper tapes sandwiched in between. Stitch with a 1/4’’ seam allowance (sewing right over the previous stitching to sew the zipper to the bag exterior). 4. Turn the bag right side out through the end where the zipper separates. 5. Carefully press the bag and lining edges away from the zipper. Topstitch along the seam 1/4’’ from the seam. 1. To make the strap tabs, fold the tab pieces right sides together with the 4’’ edges matching. Stitch. Press the seams open. Use a safety pin or bodkin to turn the tabs right side out. Press flat with the seam centered on the bottom of the tab. Topstitch 1/4’’ from the edge along both side edges. 2. To make the optional key clip strap, fold the 2’’ x 6’’ strap piece in half, lengthwise and press. Fold the long edges to the center and press. Fold the strap in half lengthwise again, and press. Topstitch along both long edges, 1/8’’ from the edge. 3. Wrap one end of the strap through the opening on the swivel clip (or d-ring). Tuck the raw edge under and stitch across the fold, securing the clip or d-ring. 4. Fold one of the strap tabs through a 1 1/2’’ d-ring and clip the ends to the exterior of the bag, centered above one of the side pockets (or at the top of the gusset). At the same time, clip the top edge of the lining gusset to the exterior too (matching the seams). Stitch across the top of the gusset with a 1/4’’ seam allowance to secure the exterior, lining, and tab together. Repeat this step at the other end of the bag too. 5. Baste the raw edge of the key clip strap to the interior of the bag near one of the gusset seams, if desired. Note: In the two photos above, the zipper is already cut off. That is because I forgot to add the tab and snap clip at first (oops). I un-picked my seam and added those pieces as seen above. 6. With the bag inside out and the zipper pull in the middle, pin or clip the ends closed, as seen above. 7. Stitch across the seam and then trim away the extra zipper tape. Repeat on the other end of the bag. 1. Press one long edge of the 1 1/2’’ x 5’’ binding strips to the wrong side by 1/4’’. 2. Place the right side of the other long edge against the seam (centered). 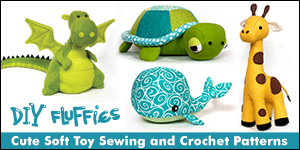 Stitch across the seam with a 1/4’’ seam allowance. 3. Wrap the binding around to the other side. Fold the sides in, and tuck the pressed raw edge under. Stitch across the binding, close to the fold. This is what it looks like on the end with the key clip. Feel free to adjust the strap length to your preference. 1. Fold the strap piece in half lengthwise and sew along the long edge. Press the seam open and turn the strap right side out using a safety pin or bodkin. Press the strap flat with the seam along the center of the back side of the strap. Topstitch along both long edges of the strap, 1/4’’ from the edges. Sew in a rectangle to secure the strap and hide the raw edges. Repeat to attach the other end of the strap to the remaining d-ring. And ta-dahhhhh! Your beautiful new hobo bag is ready for you to show off. Don’t miss my round-up of Tote Bags you can sew in an Afternoon!